Karl and Beccy hosted their wedding reception at Worcester Guildhall. Their wedding ceremony was held at St Georges Church in Worcester, after which we took a short trip to Worcester Cathedral for a few formal photos and plenty of photos of the bride and groom. 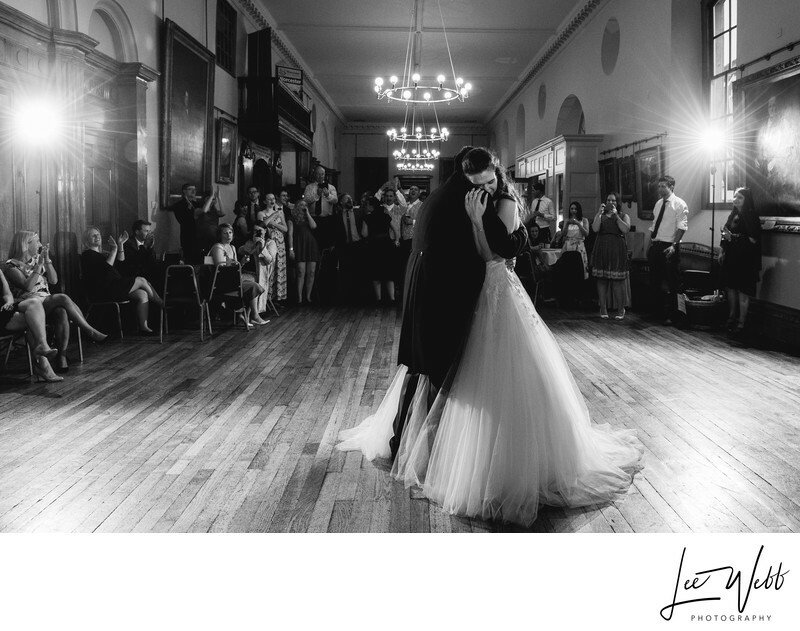 Beccy and Karl had hired all of the Guildhall to ensure that they would have exclusivity on their wedding day. Their drinks reception was held on the lower level which can be seen in the above photo. The wedding breakfast was served on the top floor, and it looked absolutely stunning. After the breakfast and the speeches, we took a group photo in the middle of Worcester High Street which was amazing! I'd like to thank Costa Coffee who stayed open an extra hour and allowed me to hang out of their first floor window to get the shot! The entire wedding was fantastic and I had an amazing time, even though I was working. Part of the evening reception spilled out onto Worcester High Street and the atmosphere was simply incredible. When it was time for the bride and groom to take their first dance, I set up a pair of off camera flashes to help give the photos as extra punch, as the ornate chandeliers, beautiful as they may be, weren't providing enough light of the right quality.